External Affair Minister Sushma Swaraj on Wednesday stated that New Delhi's relations with Moscow are one of the strongest pillars of India's foreign policy. "Our relations with Russia are one of the strongest pillars of India's foreign policy. We are celebrating the 70th anniversary of establishment of diplomatic relations," Sushma said in a joint statement with Russian Deputy Prime Minister Dimitry Rogozin. She further said that India and Russia are unanimous to further strengthen the special and privileged strategic partnership. "I just had very fruitful and productive talks with Russian Deputy Prime Minister Dmitry Rogozin. We were unanimous in our intention to further strengthen the special and privileged strategic partnership that exists between India and Russia," Sushma added. 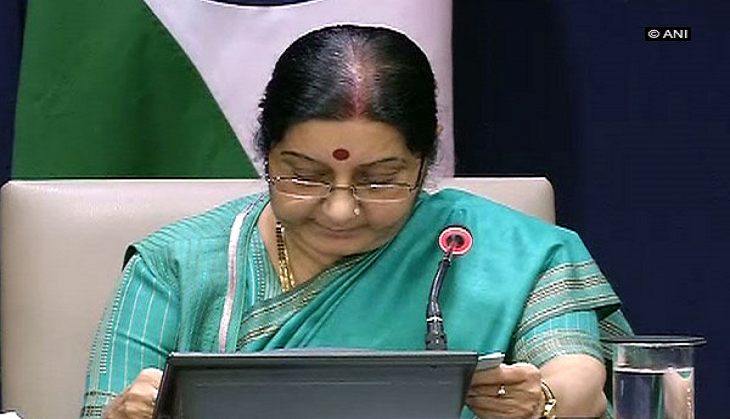 The EAM also highlighted that both India and Russia are working closely to take forward many collaborative ideas. "We agreed to work closely to take forward many of the collaborative ideas that emerged in diverse fields including security, nuclear, space, disaster management, trade and economy , science and technology and people to people linkage," she said. India and Russia today agreed to work closely in various sectors including security, nuclear energy and disaster management. Swaraj said the progress made in implementation of agreements signed between the two countries in Goa last year during the BRICS Summit was discussed. She said, the future roadmap is being implemented enthusiastically and over 100 items have been identified, adding that Ministries, Departments and private sectors are coming together to celebrate 70th year of Indo-Russian diplomatic relations. The forthcoming visit of Prime Minister Narendra Modi to St. Petersburg was also discussed during the meeting. In his statement, Russian Deputy Prime Minister Dimitry Rogozin said, the relationship between India and Russia is very dynamic and strengthening trade and economic cooperation was discussed between him and Swaraj. Rogozin, who arrived in New Delhi to take part in a meeting of the India-Russia Inter-Governmental Commission on Trade, Economic and Cultural Cooperation (IRIGC-TEC) also met Prime Minister Narendra Modi. Bilateral relations, upcoming Prime Minister Modi's visit to Russia and ways to boost bilateral trade and investment are the key aspects to be discussed.